The writing style and narration was compelling and charming. I like how the dual point of view was narrated by two different people though they were so different in personality and temperament that it wasn’t completely necessary. As with most contemporary novels the writing was effortless to read and was compelling enough to have me listening for the whole day. The plot was relatively normal for YA Contemporary but I did find it refreshing that the teenage girl didn’t have one of the two/three usual job aspirations that are repeated in this genre. It was also great to have both characters so well rounded, Dimple is determined to rebel from her parents and show that she is independent whereas Rishi is willing to put alot of his own happiness aside to live a life that will make his parents happy even though it’s not what he really wants. When it comes to friendships and their peers they are completely opposite though with Dimple always more than eager to gain the approval of everyone at the web developing summer programme and Rishi staying true to himself even if it means that his peers don’t like him. The matched and blended perfectly that it didn’t feel forced or unlikely when they started to fall for each other. I didn’t even mind that the ending was really predictable with the cliche “miscommunication trope” because I found the relationship to be quite genuine. Too often this genre has a boy that’s either too perfect or too much of a bad boy and a girl who is sensible beyond belief or different just for the sake of it. 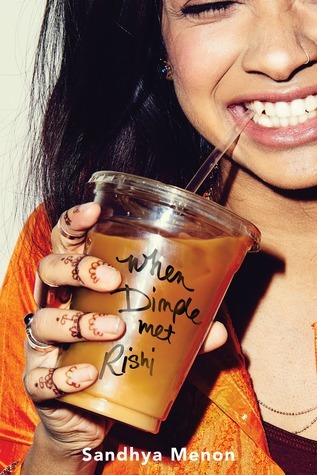 Dimple and Rishi were refreshingly well fleshed out characters and the book could have been based on a real young adult couple finding themselves and their place in their families and communities. Although I really enjoyed this book there was nothing that took it past a nice read and I felt like the ending wrapped things up a little too nicely. I think this would be perfect to read while on a sunny holiday or even just relaxing in your back garden on a weekend. If you’ve read a few too many heavy/serious books recently and need a break then I’d also recommend this one for that too. It didn’t become a big favourite but I’d be tempted to re-read it again next summer when I fancy something quick, compelling and fluffy.